The incredible thing about pasta is the seemingly limitless variety of forms that dough made from flour and water can take. There is long pasta and short pasta, fresh pasta and dried pasta. It can be coloured red with tomato or green with spinach. This versatile staple is traditionally made with durum wheat flour which has a high gluten content that prevents the pasta from breaking down in boiling water. The gluten makes pasta a food to avoid for those suffering from coeliac disease and although wheat-free pastas made out of rice, potato or corn flour are now widely available, they are unable to match the firm, dense texture of perfectly cooked durum wheat pasta. Which pasta to use depends mainly on the sauce. Short pasta tends to offer more surface area for sauce to cling to, particularly with creamy sauces. 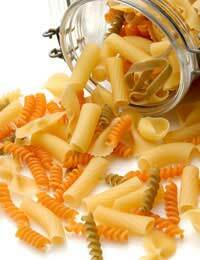 Penne, for example, will absorb sauce into its central cavity and crinkly or shell-shaped pasta often does the same. Long pasta tends to work better with tomato or oil based sauces such as Bolognese or Pesto. Al dente, meaning ‘to the tooth’ in Italian, refers to the small window between underdone pasta that is hard rather than firm and overdone pasta that is soggy rather than soft. Those used to eating pasta that has been boiled to mush fail to understand what the fuss is about but properly cooked pasta is a far more satisfying thing to eat than flattened, flaccid tubes of penne. As with all cooking, the best way to tell if it is ready is to try it. Adding oil to a pot of cooking pasta is only a good idea if the pasta is going to be stored and used cold after cooking. There is a myth that a pot of pasta needs oil to prevent the pasta from sticking together but gluten is soluble in water so, as long as the pasta is not packed too tightly into an undersized pot, an occasional stir with a wooden spoon is all that’s needed to prevent it sticking. Pasta cooked in oily water will be slightly greasy, causing any sauce to slip right off it. Adding salt to a pot of pasta helps to season it more thoroughly which will enhance the flavour of any sauce served with it. The hard gluten in pasta means that only minimal quantities of starch will be drawn into the water compared to rice, for example. Pasta sauces are usually just a simple selection of ingredients that complement each other and can be thrown together very quickly by anyone with the courage to approach a chopping board. Dice an onion and fry it until it starts to go translucent, add some finely chopped garlic and some dried herbs, perhaps a splash of red wine if a bottle happens to be open and then a tin of chopped tomatoes. Simmer on a low to moderate heat for fifteen minutes, giving you just enough time to cook a pot of penne to go with it. Add anchovies, capers and black olives for a basic puttanesca, the “whore’s” pasta. Add some chilli and fresh basil for a rudimentary arrabbiata, the “angry” pasta. Fry prawns with the onions until they are golden before adding the tomatoes. Slice a chicken breast into strips and marinade in lemon juice and garlic overnight prior to cooking and fry with the onions. Experiment with adding Cajun spice, pesto, sweet chilli sauce, mustard and other sauces, spices and condiments for a massive range of possible flavours. A basic white sauce made by mixing flour, butter and milk or cream can be added to the onions instead of tomatoes. Grated cheese can then be melted into it. This list is by no means exhaustive. The joy of cooking with pasta is the endless possibilities for invention it offers. Any meat, fish or vegetable can find its way into a pasta dish. Cooked pasta also has plenty of scope for being reused in pasta salads or pasta bakes. If pasta is going to be used in a salad, it is better to plunge it straight into cold water as soon as it is cooked to prevent residual heat from rendering it unpalatable. Pasta treated this way can last several days in the fridge. Eventually though, the starch in the pasta will begin to breakdown into sugars, giving spoiled pasta an unpleasantly sweet smell. Pasta is one of the world’s most flexible ingredients. Feel free to experiment.